We’d love your help. Let us know what’s wrong with this preview of Clare by Susan Lynn Peterson. 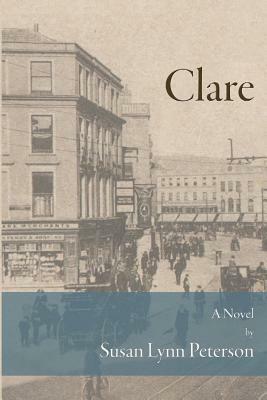 To ask other readers questions about Clare, please sign up. Won this book from a First Reads Giveaway. Very excited to read and review it. 11.29.11 - Halfway through the book and I'm enjoying reading it. Sometimes I forget that Claire is supposed to be a 14 year old girl; she seems very wise, put together, and composed. Her brothers are interesting characters. But I find myself criticizing how she handles her brother Mick most of the time. I guess it was a different time and women acted differently. But if he were my brother - man, things would be differe Won this book from a First Reads Giveaway. Very excited to read and review it. 11.29.11 - Halfway through the book and I'm enjoying reading it. Sometimes I forget that Claire is supposed to be a 14 year old girl; she seems very wise, put together, and composed. Her brothers are interesting characters. But I find myself criticizing how she handles her brother Mick most of the time. I guess it was a different time and women acted differently. But if he were my brother - man, things would be different. i enjoyed this story...as usual. I'm a big fan of this type of thing...main character traveling from another country (especially Ireland) to the United States to start a new life. Clare and her brothers are all characters I grew to love..and really felt invested in their stories. Nice, rich writing. Susan Lynn Peterson lets you live beside her characters. You are taken along with them on their journey, you can feel their wants and their fears. You want to take in Clare, her brothers Mick and Tom and give them a big hug. A warming story about family, friendships, hopes, dreams as well the cruelty and unfairness life can bring. I was curious about Clare after reading what the book was about and decided to enter the first-reads giveaway and to my delight I discovered I was a winner! :) I enjoyed this tale of a sister and her 2 brothers journey from Ireland to American in the late 1900s after the death of their mother. These children went through A LOT! A tale of children immigrating on their own and I was rather shocked at the behaviour of some people towards these children. Any chance of a sequel? Fairly good standard fare of an Irish family coming to America. I enjoyed their time in Ireland and the hardships of leaving everything behind especially Clare going to look at a church spire one last time that signified their town even though she didn't attend that particular church. This book was filled with excruciating detail. Moved way too slow for me. My name is Susan Lynn Peterson. On most days you'll find me behind my computer writing or out in the garden growing vegetables. I love a good carrot, a good day at the lake, and a good dvd (preferably with horseradish potato chips and homemade hard apple cider). I enjoy Tai Chi and karate, am hugely impressed by the way regular acupuncture and Chinese herbs have improved my life, and have never me My name is Susan Lynn Peterson. On most days you'll find me behind my computer writing or out in the garden growing vegetables. I love a good carrot, a good day at the lake, and a good dvd (preferably with horseradish potato chips and homemade hard apple cider). I enjoy Tai Chi and karate, am hugely impressed by the way regular acupuncture and Chinese herbs have improved my life, and have never met a cat I couldn't enjoy a conversation with. I tend to make sense of my life in terms of lagom (a Swedish word, which when fleshed out a bit means something like "the art of moderation"). And I was green long before it was trendy.